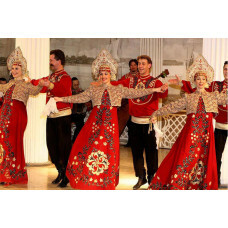 Folklore Show (or Folk Show) is a best way to experience Russian traditions, lore and spirit! Enjoy 2 hours of wild dances, vigorous singing, and fantastic atmosphere of Generous Russian soul! Your party will also be provided with famous Russian refreshments - vodka, seledka (herring), and pastry assortment. We will also provide a back transfer to your hotel! Do not hesitate - feel yourself Russian!